Scooby-Doo! 13 Spooky Tales: For the Love of Snack! HomeScooby-Doo! 13 Spooky Tales: For the Love of Snack! My oldest is a huge Scooby-Doo! Fan! She loves everything about it. There is a DVD that I wanted to share with all of you! Scooby-Doo! 13 Spooky Tales: For the Love of Snack! 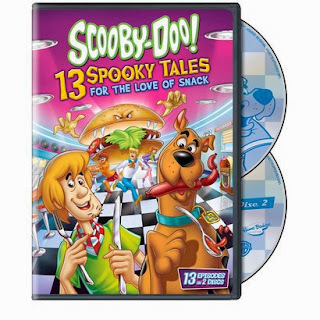 Scooby-Doo and the gang are together again in this exciting collection that’s comprised of fan favorite episodes which are offered together for the first time in one set. Strange and mystifying happenings take our favorite Great Dane and his pals on a variety of thrilling escapades the whole family will enjoy watching together. Some of my daughters favorite episodes are in this action packed set! We loved that it has a variety of episodes from the entire Scooby-Doo! Series. Scooby-Doo! 13 Spooky Tales: For the Love of Snack! features an exciting selection of suspenseful mysteries that will delight both kids and adults alike. In Wanted Cheddar Alive, the gang faces a cheese monster who puts the Scooby Snacks factory out of business. The owner of a local burger house is haunted by a burger monster on Night of the Living Burger. Big Appetite in Little Tokyo has the Mystery Inc. crew traveling to Tokyo, where Shaggy eats a cursed pizza and grows into a Godzilla-like monster. On Alaskan King Coward, Scooby and his pals uncover a prehistoric creature. These and other captivating mysteries await viewers on this not-to-be-missed release.Pre-order Scooby-Doo! 13 Spooky Tales: For the Love of Snack! on Amazon today! All thought it will retail for $19.98 SRP, Amazon has it for $16.98. Please note that Amazon prices do change on a daily basis and this price may change. Warner Bros. Animation (WBA) is one of the leading producers of animation in the entertainment industry, with an innovative and talent-rich roster boasting some of the most accomplished writers, producers and artists working today. The studio is on the cutting edge of animation technology and has both CG and traditionally animated projects in current production and development. For TV, WBA produces series such as The Looney Tunes Show, MAD, Teen Titans Go! and the forthcoming Beware The Batman and The Tom and Jerry Show for Cartoon Network. WBA also produces series and additional original content — including animated shorts — for Cartoon Network’s multiplatform branded DC Nation programming block. In addition to TV programming, WBA produces theatrically released CG cartoon shorts featuring iconic Looney Tunes characters, rendered in stereoscopic 3D. WBA also creates the highly successful series of DC Universe Original Animated Movies for DVD. Producing for multiple platforms including TV, digital and home entertainment both domestically and internationally, WBA is highly respected for its creative and technical excellence, as well as for maintaining the Studio’s rich cartoon heritage. It is also the home of the iconic animated characters from the DC Comics, Hanna-Barbera, MGM and Looney Tunes libraries. One of the most-honored animation studios in history, WBA has been honored with six Academy Awards®, 35 Emmy® Awards, the George Foster Peabody Award, an Environmental Media Award, a Parents’ Choice Award, the HUMANITAS Prize, two Prism Awards and 20 Annie Awards (honoring excellence in animation). Warner Bros. Home Entertainment (WBHE) brings together Warner Bros. Entertainment's home video, digital distribution, interactive entertainment, technical operations and anti-piracy businesses in order to maximize current and next-generation distribution scenarios. An industry leader since its inception, WBHE oversees the global distribution of content through packaged goods (Blu-ray Disc™ and DVD) and digital media in the form of electronic sell-through and video-on-demand via cable, satellite, online and mobile channels, and is a significant developer and publisher for console and online video game titles worldwide. WBHE distributes its product through third party retail partners and licensees, as well as directly to consumers through WBShop.com.